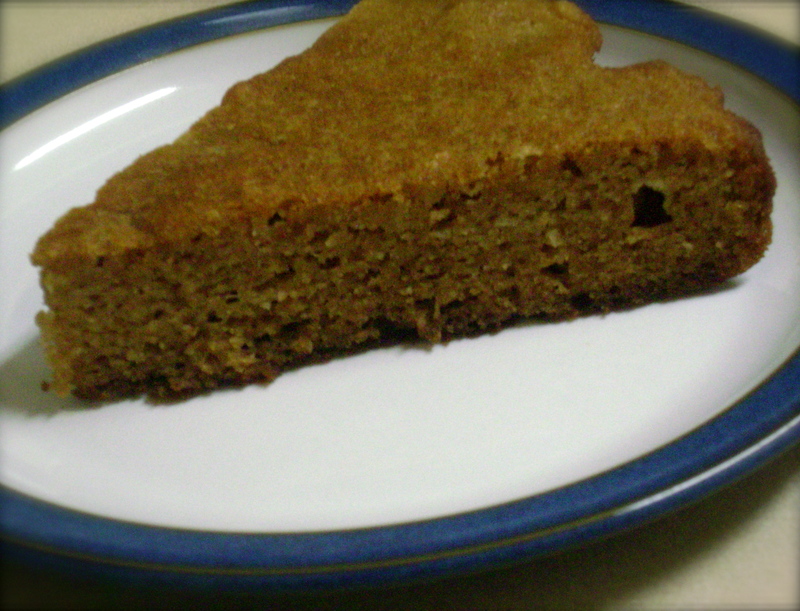 This is a really nice gingerbread cake recipe. It uses a combination of coconut flour and almond flour; the batter is creamy with the addition of coconut milk, honey, oil, and eggs, and it is flavoured with traditional gingerbread spices. The result is a wonderfully moist almost sponge-like cake. This recipe is based on a “Magically Moist Almond Cake” from Bob’s Red Mill. The coconut flour absorbs moisture and based on that fact, not very much is needed. Preheat oven to 350ºF and line a 9-inch cake pan with parchment paper. In a medium or large bowl, stir the honey and oil together until the honey is near creamed or is beginning to have a “grainy” appearance. Stir in the coconut milk, eggs, vanilla, and spices. In a separate small bowl, incorporate the flours and baking soda and fold into the wet ingredients OR add the almond flour, coconut flour, and baking soda one at a time, adding the next after each addition. Blend well and stir out any lumps. Once the batter is smooth and free of lumps, transfer batter to the cake pan and spread out using hands. Bake 30 minutes. When the cake is done, it should have the characteristic colour of gingerbread and should spring back when touched and/or when a knife comes out clean from the centre. Thoroughly cool the cake before slicing, to prevent possible breaking. Serve as is, or with Whipped Coconut Cream, or your choice of ice cream. Enjoy! Did you really have a recipe for coconut whipped cream?! I clicked on the link, and a ‘not found’ page came up. Could you maybe re-post it? Pretty please? Hi Katie, I’ve updated the link now. Thank you for letting me know about that! Hope you like the whipped coconut cream. Hey Zoe, This sounds delicious. I’m adding it to my Thanksgiving recipe roundup. Thanks, Iris! It’s really good – hopefully the recipe speaks for itself, not so much the photo in this case. Just made this tonight, subbed out Stevia truvia for the honey and used only 3 eggs. I added a tablespoon of molasses and 2 tsp baking powder and a 1/2 tsp salt. The cake was tender, moist and delicious. Thanks for the recipe. Hi Mary, I’m so glad the recipe worked out for you and with the subs! Thanks!